Using the Winamp Plugin you connect to a SHOUTcast server and manage playlists using Winamp as well as use the microphone or take sound from a line-in sound source. Winamp SHOUTcast DSP Plug-In supports multiple streams (mount points). Mixxx has a cutting-edge mixing engine including support for MP3, M4A/AAC, OGG, and FLAC audio, adjustable EQ shelves, timecode vinyl control, recording, and SHOUTcast/Icecast broadcasting. SAM Broadcaster is an Internet radio broadcasting application by Spacial. The name "SAM" is an acronym for Streaming Audio Manager, which describes the software's functionality. 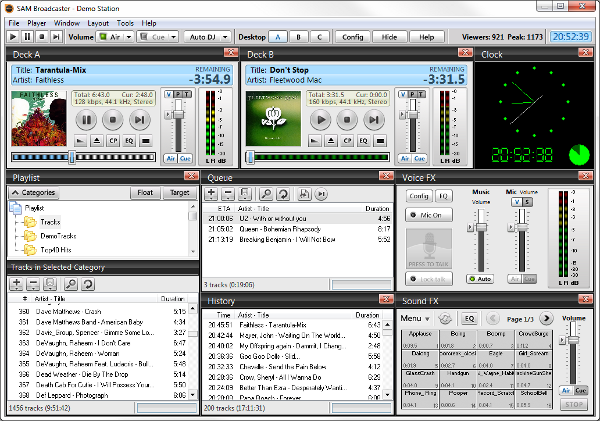 The software features functionality for running an Internet radio station from a single computer. It can be used for running Live Shows with a DJ selecting the tracks to be played and mixing the sound as well as completely automated, where the programming is controlled by various rulesets outlined by the operator using PAL scripts to select tracks and queue shows. SAM Broadcaster connects to most common streaming servers, such as SHOUTcast v1 and SHOUTcast v2. For statistical purposes, the listener counts as reported by the streaming servers are displayed as a graph in the GUI. The software also comes with a tool to generate reports on listener count and played tracks as required by various licensing bodies, including ASCAP, BMI and SESAC for royalty purposes. With SAM Cast broadcast any sound playing over your soundcard, microphone, or line-in source over the Internet. SimpleCast features MP3, mp3PRO, OGG, and advanced WM9 (Windows Media 9) streaming. Encode at multiple bitrates and multiple formats to multiple server types simultaneously. Supported servers include Live365, SHOUTcast, Icecast2, and Windows Media Server. SimpleCast also lets you view in real-time how many listeners are connected on all of your servers, and it can interface with many automation systems. Designed for home DJs, VirtualDJ Home includes nearly all the features of VirtualDJ Pro, with only a few limitations. If you don't own or don't plan to use any additional DJ hardware (mixer, turntable, DJ controller or video projector), then VirtualDJ Home will meet all your requirements. 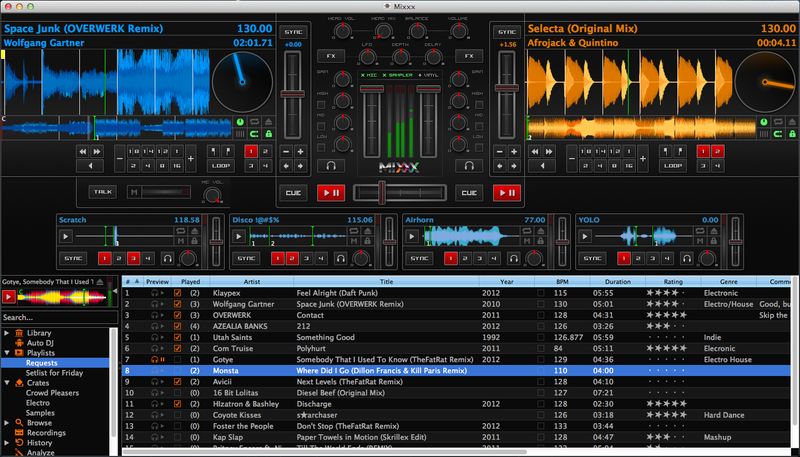 Random music styles, fades and automatic overlaps between songs based on sound level, DTMF tones detection without additional hardware, remote control through the parallel port, a complete events system, four aux players and handling up to six sound cards simultaneously are some of the features that have made it a very popular solution in lots of stations around the world. Would you like to broadcast live from your smartphone?